Mississippi neon underglow usage is governed by the state's Code. All relevant laws, rules and regulations pertaining to vehicle lighting including car underglow in Mississippi have been provided below. Make sure to examine the regulations carefully and do not use any restricted lights. Usage of neon underglow lighting is governed by Mississippi Statutes, Title 63: Motor Vehicles and Traffic Regulations, Chapter 7: Equipment and Identification, General Provisions. Is neon underglow legal in Mississippi? Mississippi law does not restrict additional after-market vehicle lighting which would include neon underglow, but it does restrict colors which may be visible while the car is in motion. Therefore it’s our conclusion that in Mississippi neon underglow is not illegal. There are no relevant MS state laws to restrict or prohibit installing underbody lights, meaning they are legal to use while not on a public road. Below are all relevant excerpts from Mississippi Vehicle Code that limit, restrict or allow certain aftermarket lights to be installed on vehicles. (1) It is unlawful for any person, other than a law enforcement officer on duty, to use or display blue lights on a motor vehicle as provided for in Section 63-7-19. (2) It is unlawful for any person to use or display red lights on a motor vehicle except as provided for in Section 63-7-19. It is not unlawful for the red lights authorized for private or department-owned vehicles used by firemen of volunteer fire departments, as provided in Section 63-7-19, to remain mounted on such vehicles when the lights are not in use. (3) It is unlawful for any vehicle to use alternating flashing headlights except an emergency vehicle as provided in Section 63-7-19. (4) A person violating this section is guilty of a misdemeanor and, upon conviction, shall be punished by a fine of not less than Fifty Dollars ($ 50.00) nor more than Five Hundred Dollars ($ 500.00). (a) All front clearance lamps, and all side marker lamps, except the one on each side at or near the rear of any bus, truck, truck tractor, semitrailer, full trailer or pole trailer, shall when lighted display an amber color. (c) All rear clearance lamps, the side marker lamps on each side at or near the rear, and any other lamps mounted on the rear, on any bus, truck, truck tractor, semitrailer, full trailer or pole trailer shall when lighted display a red color. However, the stoplight or other warning device on the rear of any motor vehicle may be red or amber. (d) Backing lights of any color may be mounted on the rear of any motor vehicle if the switch controlling such lights be so arranged that they may be turned on only when the vehicle is in reverse gear. Such backing lights when unlighted shall be so colored or otherwise arranged as not to reflect objectionable glare in the eyes of drivers of vehicles approaching from the rear. (2) Auxiliary white lights mounted on or near the rear of a motor vehicle, or visible from the rear of the vehicle, shall not be prohibited under the provisions of this section if (a) the vehicle’s gross weight is less than twelve thousand one (12,001) pounds, and (b) the lights are designed by the motor vehicle manufacturer or an after-market parts manufacturer so that they may only be illuminated whenever the vehicle is not in motion and the transmission of the vehicle is not capable of transmitting power to the wheels. (3) No provision of this section shall be so construed as to prohibit the use of any white light or lights for the purpose of illuminating license plates. (4) Any lamps illuminated when the vehicle is in motion, other than those expressly required or permitted by the provisions of this chapter, shall, if visible from the front, display a white or amber light; if visible from either side, display an amber light; and if visible from the rear, display a red light. Violation of vehicle lighting laws is a misdemeanor as per section 63-3-7. Using blue or red lights is punishable with a fine ranging from $50 to $500. Our information about car neon underglow laws in Mississippi was last updated in 2018 and checked in 2019. In case any info we provided is not up to date or correct be sure to contact us so we can revise it. Thank you! Check our data with your local law enforcement or other relevant agencies! 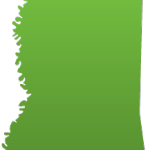 Mississippi underglow laws in certain cities or counties may be different from state legislation. While we do our very best to provide the most accurate information about LED and neon street glow usage we will not be held liable for any potentially incorrect or misinterpreted info. Have questions about traffic or neon glow laws in Mississippi?